Ouranos, or Uranus, was at one time the most important god within the Greek pantheon of deities; as two generations prior to the rule of Zeus, Ournos was the supreme deity of the cosmos. According to Hesiod’s version of the timeline of Greek deities, Ouranos was classed as a Protogenoi, one of the primordial gods of Ancient Greece. To this end, Ouranos was born of Gaia (Earth), with no father involved. 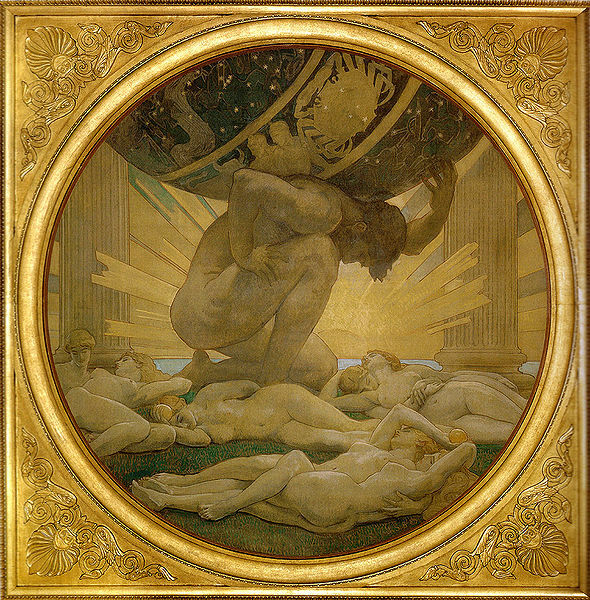 Just as Gaia was Mother Earth, Ouranos was considered to be Father Sky, the personification of the great brass dome that was thought to stretch above the earth. Ouranos took up the mantle of supreme deity, and sired children with Gaia. Six sons quickly followed, the three Cyclopes (Brontes, Arges and Steropes) and the three Hecatonchires (Briares, Cottus and Gyges); both sets of sons being powerful giants. Indeed, such was the power of these giants that Ouranos worried for his own position as supreme deity. So, Ouranos decided to lock his own sons within the belly of Gaia. Twelve more children were then born to Ouranos and Gaia, six sons and six daughters; the sons being Cronus, Crius, Coeus, Hyperion, Iapetus and Oceanus, whilst the daughters were Rhea, Phoebe, Themis, Theia, Tethys and Mnemosyne. Collective these 12 children of Ouranos were known as the Titans. Ouranos was less wary of the power of the Titans than he had been of the Cyclopes and Hecatonchires, and so allowed these 12 children to roam free. This decision would ultimately lead to his downfall. Locking up the Cyclopes and Hecatonchires within the earth caused Gaia great physical pain, and so she plotted with the Titans to overthrow their father. Eventually the uprising went ahead, and when Ouranos descended to earth to mate with Gaia, the four brothers Crius, Coeus, Hyperion and Iapetus, held tight to their father at the four corners of the earth, whilst Cronus wielded an adamantine sickle to castrate Ouranos. The castrated Ouranos was allowed by Cronus to ascend once again to the heavens, but Ouranos had lost most of his powers, and no longer had the strength to be the supreme deity, and so Cronus succeeded Ouranos as supreme god of the Greek pantheon. The castration of Ouranos caused the Greek sky god to become father to more children. As the blood of Ouranos fell onto Gaia so were born the Gigantes, a race of 100 troublesome giants, the Erinyes (Furies), the three goddesses of vengeance, and the Meliae, the nymphs of the ash woodlands. A further daughter was born of Ouranus when his castrated member fell into the earth’s waters, for Aphrodite, the Greek goddess of beauty, was born. As the castrated Ouranos ascended to the heavens, the god of the sky uttered a prophecy that just as his own son had overthrown him, so the son of Cronus would usurp him. Cronus would try and circumvent the prophecy by imprisoning his children within himself, but Zeus avoided such a fate, and would lead his allies in a war against the Titans, the Titanomachy. Ouranos would not be involved in the fighting, but the war was of such great intensity, that the very heavens were badly shaken. The damage inflicted on Ouranos during the war was such that after the end of the Titanomachy that Zeus would punish Atlas by having the Titan hold up the sky (Ouranos) for eternity. And of course, Zeus would become the third supreme deity of the Greek pantheon.